It’s a Cabrini Kind of Monday!!!! Tonight at Casa Tamburini, we are indulging in an old favorite: Aunt Christine’s Spinach Cabrini!!!! 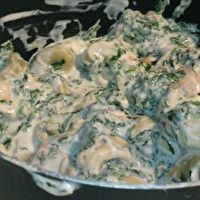 The recipe originates from the Junior League of Denver, Colorado, cookbook: “Creme de Colorado.” Aunt Christine has brought this sumptuous dish to many family gatherings and it is always a BIG HIT in the comfort food department!!!! Bon Appetit! In a large bowl, stir together all ingredients. Place in a 9×13″ casserole dish. Bake uncovered at 350 degrees for 45 minutes.